Yesterday, I mentioned that I’d be writing about Shirataki Noodles today. I imagine many of you don’t know about these noodles since I had never heard of them myself until about a week ago. That’s when I was reading LivinLaVidaLoCarb, and happened to catch a post talking about noodles made from fiber with practically no carbs, fat, or calories to speak of. I was even more intrigued when I read about another brand of Shiritaki Noodles that LivinLaVidaLiCarb claimed had a more authentic pasta feel. I had to try them. The noodles I purchased were made by House Foods, and I found them in a Wild Oats store near my house for $1.59 for an 8 ounce package. You can also buy them online at Amazon.com if you can’t find them where you live, but they have to be shipped cold so they can be expensive when purchased that way. According to the label, the noodles contain: Filtered Water, Tofu (Soybeans, Calcium Sulfate, Glucono Delta Lactone), Yam Flour, Calcium Hydroxide, and no Preservatives. 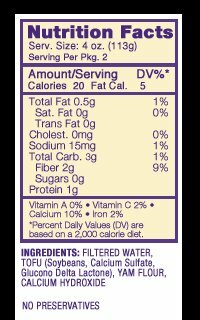 You can see by checking the nutrition content that the noodles contain very little fat, sodium, or carbs, and are mostly fiber. They have little taste on their own, but absorb the flavor of whatever sauce is used on them. Several places I checked mentioned the odor of the noodles, but I didn’t find it that strong, kind of like a mild fish sauce smell. When you open the package you rinse the noodles, and then cook them about 3 minutes, and the smell completely disappears. I liked these noodles quite a bit and would use them again for an Asian noodle dish like the one I made here. For Italian pasta, I will probably stick with Dreamfields, but if you’re really limiting carbs, or simply want to limit calories, these are a healthy and tasty alternative to traditional noodles. The dish below, something I experimented with to try the noodles, was so good I can imagine myself eating this all the time in the summer when I would make it for lunch. Drain noodles and rinse. Put noodles on cutting board and cut through several times to make them 3-4 inches long. Bring pan of water to a boil. When it boils, add noodles and cook 3 minutes. Do not overcook. 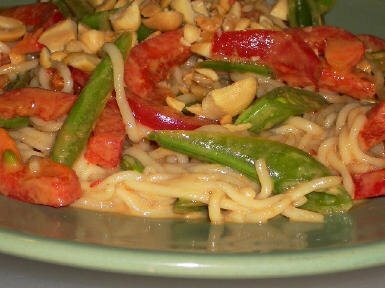 Drain noodles, rinse with cold water, and let them drain in colander while you cut up red pepper and snow peas and chop peanuts. Put peanut butter in glass measuring cup and heat in microwave about 2 minutes, or until very soft. Add soy sauce, sesame oil, and Chile Garlic Sauce and whisk together until well combined. In mixing bowl combine noodles, veggies and sauce. Divide between two serving plates and sprinkle with peanuts and chopped cilantro if using. Serve at room temperature. This would be a great side dish for something like Forbidden City Chicken, Roast Chicken with Cilantro and Lime, Grilled Chicken Sanpete, or Grilled Salmon with Maple Syrup Glaze. You could also eat this like I did, as a meal in itself for a tasty and nutritous lunch. 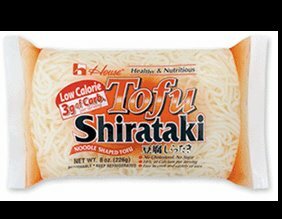 I found Shiritaki noodles at Trader Joe’s. Made a quiche using part skim ricotta, spinach, mushrooms, canadian bacon, and eggs…it was delicious and a square for breakfast was quite filling. We were able to find the noodles at a Oriental grocery store. Nothing personal against the person who left that comment, but I just can’t let people leave links in comments. Send me an e-mail if you want to tell me about your blog. Oops, Annita, didn’t mean to leave you out. Fun finding your blog. Jill, Sara, SusanV, and Sher, the noodles were really good. Ed, I know how you feel. that was the story of my life before I started eating this way. Fiber, I love peanut sauce. If anyone has a great recipe for it I would love to try it. Its completely new to me..I’ll definitely have to check this on my next grocery shopping..
I’ve been wondering how those noodles tasted. Of course, anything with a peanut sauce has got to be good. Low-carb noodles? That’s great since I had to dress up for work today and my pants didn’t fit. I think I’m gonna have to go back on South Beach for a while. I’ve never heard of these. I’m going to look for them at Whole Foods. The picture looks FABULOUS!! What a great recipe. I know I’ll have no chance of finding those noodles here, but I’ll keep my eyes open. I have heard about these noodles for quite some time, mainly via hungry-girl.com. I’ve been meaning to try them, but I haven’t been to my nearest Wild Oats or Whole Foods lately. Since I know you found them at a Wild Oats, I may have to look for them soon. I’m glad to hear another good review!